Providers and health plans alike are touting these Web-based tools as more patients become receptive to the idea. PHR may not be part of our daily vernacular, but that may soon change as more patients realize the technology’s potential power to help manage chronic and other conditions. PHRs allow patients to access lab results, track health data, compile immunization records, learn about health conditions, and more—all with the simple click of a computer mouse. According to a recent survey conducted by the California HealthCare Foundation (CHCF), PHR use in the United States has increased considerably in the last couple years. Seven percent of the 1,849 survey participants said they’ve used a PHR or website where they could get, keep, and update their health information online. This is more than double the proportion identified in 2008 through research conducted by the Markle Foundation. The CHCF study is the first of its kind to monitor PHR use on a national level, says Tresa Undem, lead researcher and vice president of Lake Research Partners in Washington, D.C. Although the survey points to increased PHR use, perhaps the most promising result is that the technology is helping patients actually improve their health. The survey, administered by Knowledge Networks, relied on random probability sampling, covering 99% of U.S. households. It was conducted in English and Spanish between December 18, 2009, and January 15, 2010. The sampling method makes the results highly reliable and able to be generalized to the U.S. population at large, says Undem. This increased use of PHRs reflects a growing sense that patients want to take greater control over their health, she adds. “There is a sense that you have to be responsible for the kind of care you get. That requires a lot of work, and I think a PHR does a lot of that work for you,” Undem says. The national CHCF study is one way to collect data regarding how consumers are using PHRs, the benefits they’re deriving from them, and the challenges they face in using them, says Sam Karp, vice president of programs at the CHCF. “Using these survey results, we’re hopeful the healthcare industry can be more responsive to meeting consumers’ needs and desires to be more engaged in their care,” he says. According to Karp, one of the survey’s most interesting findings is that participants with two or more chronic conditions use a PHR far more often to improve their health than do those with fewer than two chronic conditions (40% vs. 24%). “That was encouraging to us,” he says. However, anyone with a health condition that requires ongoing monitoring can benefit from a PHR, he adds. Examples include people with diabetes who must monitor their blood glucose level, those with anemia who must monitor their blood count, or those who must simply track their weight. In terms of nationwide PHR adoption, the West leads the way, according to the survey. Eleven percent of participants who have used a PHR reside in this region, double the proportion of those in other areas. An even larger share of Californians (15%) has used a PHR. “We believe the findings of the survey likely reflect the high penetration of personal health records use by members of Kaiser Permanente, which is both a health plan and a medical group. All of their members have access to PHRs, and many people use them,” says Karp. The West, particularly California, also has more large, multispecialty medical groups than other parts of the country. Many of these groups also offer PHRs. Karp says PHR offerings are also generally higher in areas where EHRs have already been implemented, as a PHR is often a module of an EHR. The survey revealed several other demographic findings of interest. For example, although lower-income and ethnic minority patients had more limited access to a PHR than more affluent counterparts, they valued that access more than their counterparts. “That has significant implication and suggested to us that community health centers that generally see lower-income patients should be thinking more about offering personal health records as they adopt EHRs because the populations they provide health services to value having access to that information about their health,” says Karp. Fifty-six percent of those using a PHR said they feel as though they know more about their health as a result of using a PHR. Fifty-two percent said they feel they know more about the care their doctor provides while 40% said the PHR led them to ask their doctor a question they may not have asked before. Among respondents who do not have a PHR, 40% expressed interest in using one. Elsewhere, nearly one half of caregivers were interested in using a PHR for the person for whom they provide care. Patients at Missouri’s Citizens Memorial Healthcare (CMH) and its associated clinics can sign up for Google Health, which uses PHR Connect to extract patient data from the hospital’s EMR, convert it to XML, and deliver it online to patients within minutes. CMH launched its Google Health/PHR Connect application in March and currently has 165 active users. • printing a wallet-sized card that includes important medical information. According to Fraser, CMH decided to partner with Google Health because the application is designed to meet the criteria for the continuity-of-care record (CCR), an American National Standards Institute-accredited HIT standard. “We also liked that it was free to the patient and allows him or her to gather information from a variety of sources as well as enter information,” she says. The hospital can also request imports from Google Health into its EMR. “This pulls all the data in a Google Health account into an external report that is available to our clinicians with one click in the EMR,” says Fraser. The report indicates where the data originated (ie, CMH, another provider or pharmacy, or the user). “The data can then be reviewed with the patient and accurately entered into the correct portion of our EMR,” adds Fraser. Physicians (both CMH physicians as well as any other physician who is connected to Google Health and an EMR) can use the import feature to pull data. This includes patient-entered data, data pulled from the EMR, and data from other healthcare organizations or pharmacies that are connected to Google Health. For example, a patient may have stopped or started taking a vitamin or a supplement that could have an effect on one of his or her medications. Reviewing information stored in Google Health could avoid a potentially hazardous drug interaction. “It may not seem like a big deal to the patient. They may think, ‘It’s just another vitamin.’ They may not even tell their provider about it during a visit. But if they’ve added it to their Google Health account, our providers can pull that information and review it with the patient,” Fraser says. If an outside physician doesn’t have access to Google Health or an EMR, patients can simply e-mail or print the information. They can also access the website from their physician’s office. One primary benefit of a PHR is that it helps alleviate anxiety that sometimes results from consultations during which a significant amount of information is discussed. Patients can sometimes feel overwhelmed with information they receive during a typical doctor’s visit, and PHRs—particularly when they are linked to a platform that’s available anywhere there’s an Internet connection—help them understand that information at their own pace, Fraser says. “Lab results, new medications, and new diagnoses can be a lot to digest during a typical doctor’s visit. Since the information is sent to Google Health when it’s filed in the EMR, patients can review all of that information when they get home,” she explains. Although it’s still too early to tell how patients will use the PHR to manage chronic and other conditions long term, Fraser anticipates those with diabetes will reap the greatest rewards. “Google Health provides a graphical interface for lab results, so users can trend their results over time. They have an easy-to-read pictorial representation of their lab histories for particular tests instead of just a string of numbers,” she says. 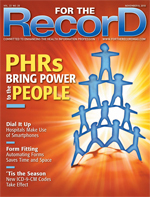 Elder patients may be able to take particular advantage of a PHR. “Elderly patients can share their Google Health records with their children. If the child can’t make it to the appointment, they can still review the diagnosis, medications, test results, and procedures from that visit,” says Fraser. Members of the University of Pittsburgh Medical Center (UPMC) Health Plan can take advantage of an entire suite of tools and services aimed at improving health and wellness, one component of which is MyMedicalHistory, a PHR launched in 2007 that recently underwent a comprehensive redesign for improved usability. As with other health plans, UPMC’s PHR includes claims-based rather than clinical information. These data include medications, prescriptions, labs, diagnostic tests, vaccinations, and office visits. Members can also self-enter information regarding allergies or over-the-counter drugs or supplements they’re taking. The main difference between a PHR sponsored by a health plan vs. one sponsored by a provider is that a health plan’s version includes information that’s based on how episodes are coded from a financial and billing standpoint, says Scott Haas, director of consumerism for UPMC Health Plan. Unlike a provider-sponsored PHR that includes information regarding services rendered by that specific provider, one that is sponsored through a health plan includes information regarding any services for which the health plan pays, regardless of provider. “I think it can be a wider breadth of information but not necessarily as deep,” Haas says. This wealth of claims information, which includes most if not all healthcare services each member receives, makes the data relevant and actionable, explains Haas. UPMC Health Plan uses computerized algorithms to analyze the data and pinpoint potential gaps in a member’s care, such as an annual Pap smear or a diabetic eye screening. These gaps display in the users’ PHR as reminders to stay on track with their health. “We use that information to populate other information systems on the back end where care managers and nursing staff use it to perform outreach to populations of members who fall into certain categories based on their conditions,” says Haas. One advantage of this is that UPMC can target its outreach efforts and work closely with physicians and nurses from a care management standpoint, he adds. Many of UPMC Health Plan’s PHR users are those who currently have health problems—not those who are healthy, says Haas. “I think what you’ll find is that most people who are fairly healthy have very little reason to use or seek out information from the PHR standpoint. It’s more useful for folks who actually have a condition and are looking for ways to track and make sure they understand all the different medications they’re on, different appointments, etc,” he says. Nonetheless, the PHR does offer healthy users convenient tools such as a printable medical history, a prescription history with refill options, educational materials, and health trackers to monitor weight, diet, exercise, and blood pressure. UPMC Health Plan continues to look into different ways in which it can better engage members. Under current development is a plan to integrate its PHR with that of UPMC so that it’s interoperable and completely seamless to the user, says Lisa Khorey, director of UPMC’s interoperability program. UPMC Health Plan is also trying to find ways to make the PHR portable so patients can share it with other providers, she adds.